Sustainable design, future-proof or fad? We’ve been working with some of the most skilled and innovative British designers since our beginnings in the 1960s, and sustainable design is definitely one of the major emerging trends over the last few seasons. Corian achieved zero landfill status back in 2012 by reusing and recycling waste during the manufacturing process. By using scraps and sanding from making solid surface sheets, as well as responsibly reusing packaging and manufacturing materials, makers DuPont have managed to futureproof their own business as well as the installations that are created from Corian. But sustainable design runs deeper than the manufacturing process, and each week it seems we’re inundated with astounding examples of design for the home that prove that sustainable design is accessible to everyone and really worth investing in. Here are just some of our favourite examples. As part of his studies at Nottingham Trent University, Jamie has carried out research into thelack of utensils in modern kitchens and discovered that customers often find them ugly and out of place in a stylish kitchen setting. Jamie decided that using the waste from new Corian kitchens would be the ideal way to create something bespoke and stylish for homeowners that will complement their new design as well as save scrap material from landfill. The result was the Cena collection a classic utensil set for the modern home. This innovative reuse of scrap materials is a sustainable solution due to the longevity and durable nature of Corian too. Its nonporous qualities prevent stains from penetrating the material, making them easy to clean and completely hygienic. Oxfordshire based designer Jay Watson asked local fabricators and kitchen studios for out-of-date Corian samples to create this abstract pixellated unit. Using sustainably sourced birch plywood for the frame, the unit comprises three drawers with a cupboard either side. Touch opening mechanisms complete the sleek look and feel. Watson says he chose Corian due to its durability and easytocare for properties. As well as a unique and artistic addition to the home, the credenza is practical too as users can place items on the tabletop without marking or water damaging the surface. Any scratches can be easily sanded or buffed out, making this piece of furniture easy to repair and able to stand the test of time. Another graduate of Nottingham Trent, Gregg Parsell has used the translucent properties of partially recycled Corian to create these beautiful spiral light pendants. By combining American Black walnut with Glacier White Corian, Parsell achieves a dramatic contrast. Routed lines within the spiral, reveal an illuminated pattern with the overall piece inspired by seed pods. 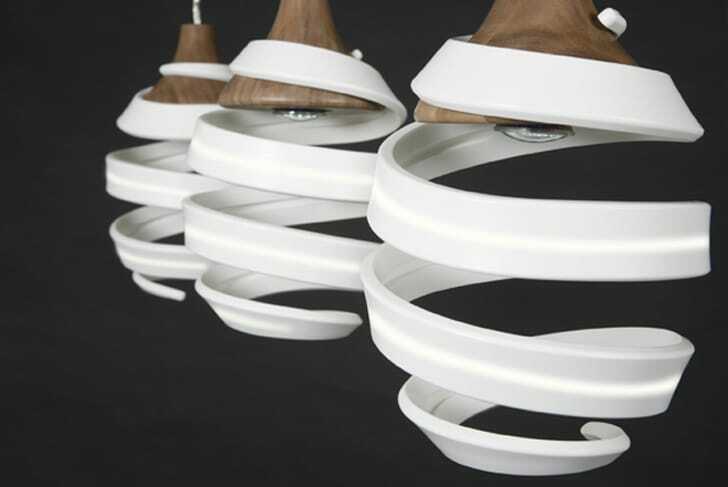 The wood and Corian parts are removable and at the end of the pendant’s life can be recycled separately to further minimise its impact on the environment, meaning consumers with a conscience can still get their fix of style. With designs such as these breaking into the British market, homeowners are provided with sustainable solutions to everyday home design issues. Cutting down on resources, reusing and recycling helps keep costs down but also safeguards the future of design for the home, making it much more than a passing trend. Written by Gary Baker. Gary is the MD of CD (UK) Ltd, the exclusive distributors of Corian in the UK. For more solid surface design ideas and inspiration, you can read Gary’s blog on cdukltd.co.uk.